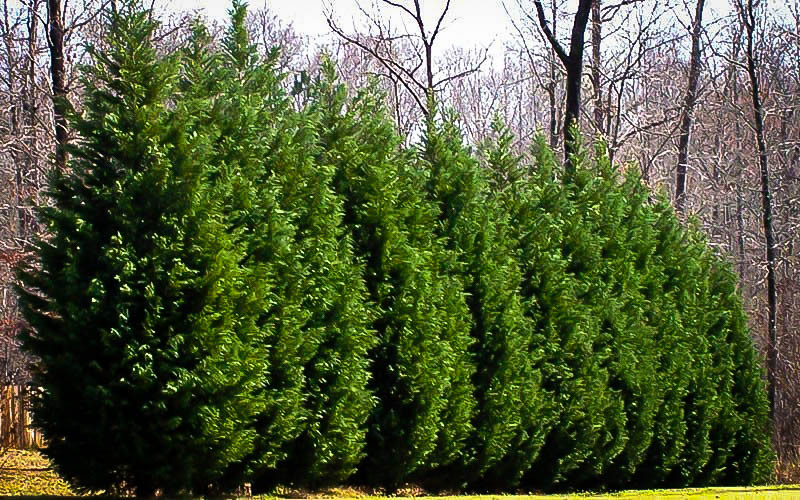 Leyland cypress, or leylandii, are extremely useful trees. They’re fast growing, and can be used to quickly create an effective hedge or screen. They’re also easy to look after, needing little or no fertilizer and only requiring water during prolonged droughts. Usually the only real work needed is regular pruning if you want to manage the tree’s size and shape. Of course, having a problem-free leylandii does depend on getting everything right when you plant it. It isn’t too hard to find the right conditions for a Leyland cypress. They’re tough enough to thrive anywhere in USDA hardiness zones 6 to 10, and while they prefer full sunlight they can tolerate some shade too – and mature trees are usually tall enough that not much will throw a shade on them anyway. As long as the soil is well drained they can handle a wide range there, too. Organically rich, moist soil is best, but leylandii won’t be put off if it’s not up to that ideal. Just don’t leave them with their roots in water and they’ll generally be fine. A more important factor is planting in the right place. If you want a specimen tree, make sure it has plenty of room to grow; they can be quite wide at the base, so you’ll want to leave plenty of clearance from your home or other trees. For hedges or screens it can be more complicated. You can’t plant a row of trees too close together or they’ll crowd each other, and the weaker ones can get smothered. On the other hand you don’t want big gaps when the trees are young. Instead, if you have the space, consider planting a staggered row. That will minimize gaps while giving the trees plenty of room. The best rule of thumb for spacing is to decide the height you want, then divide by four. For example if you want a 30-foot-high screen, plant your cypresses about seven feet apart. You should plant Leyland cypress when the tree is dormant. Get a good quality tree from The Tree Center, ideally in mid-fall. Around six weeks before the first frost is the perfect time to plant, but it’s not critical; you can get your tree started any time the ground isn’t frozen, although planting when it isn’t dormant can stress the tree slightly. Dig a hole as deep as the root ball and about three times as wide. Loosen the sides with a fork, but not enough that they collapse; then set the tree in the center of the hole and gently spread the roots out. Take care not to bend them sharply, because they can be fragile. Once the roots are spread, backfill the hole. The root collar should be about two inches above the surface. While the soil is still loose water the tree, then tamp down lightly. Finally apply a three-inch layer of organic mulch, leaving a six-inch clear space around the trunk. Finally place a stake close to the trunk and attach the tree to it with a rubber strap. During the first growing season water the tree deeply once a week, and keep the area round it clear of weeds. Once it’s been in the ground a few months its root system will soon be large enough to keep it supplied with water and nutrients, and you’ll be well on the way to success with one of the largest and most impressive evergreens around. Is it safe to plant these in the 5 foot setback between my septic tank and fence/property line? Will the roots damage the septic tank–and will the septic tank be too much to keep the trees healthy? It’s very sandy soil (Northeast Florida). How wide spread the roots of these trees grow? Is it safe to plant the leyland cypress to be within 4 feet from the swimming pool? Will the roots damage the pool wall? I planted 3 little leyland cypress trees beside my pool a few years ago. Now they are about 10 feet tall. I am worried that their roots will damage my pool and wonder if I should have them cut down. Your advice will be greatly appreciated. Cut them down now or trim them back and dig around them to sever the roots. Yes, this will weaken the anchoring of the tree, so trim the tree back and keep them at 10′ or less. I had one that was 4′ tall when I planted it 8 feet from my house in Virginia. From years 8-10 it doubled in size, then up to 25 feet tall by about year 12 or so. The windstorms we had in March (2018) over-stressed the shallow root system and it fell over my power lines into the house. I found that the root system was at least 25 feet in diameter; when it was damaged, the big roots disrupted the top soil out 5-8 feet from the tree. So if you have planted these near your pool, you need to prepare for the tree to fall but not rip up your wall, or even your pool. See if you can find a place to rent an air spade. This is a tool that blows the soil off the root system, allowing you to move it completely – since it is now much lighter. At 12 feet tall you will need a 5 or 6 foot wide rootball otherwise, which is going to be hard to move – very heavy!